Each year, thousands of people from all walks of life leave the security of their nine-to-five jobs to pursue careers as independent financial consultants. For a great many of them, the experience is financially and personally rewarding beyond their expectations. 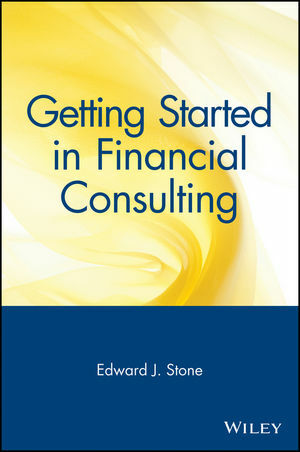 If you, too, are thinking about taking the big leap into becoming a financial consultant, but you aren't sure how to go about it, this book is for you. Edward J. Stone has been a full-time consultant, specializing in the financial and business computing industries, for more than a decade. He is the editor of the Journal of Corporate Accounting and Finance, and the editor/writer of the newsletter Banks in Insurance Report. Investment Adviser or Personal Financial Planner? Contracts and Others Legal Considerations. Should You Sell Products?... And Other Ethical Issues. Surviving in a "Down" Market.